We are very proud of the fact that FairMail Peru photographer Mariaflor was awarded with the prize for being the best student of her faculty over the past semester. As special as this news sounds, it is actually already the third time that Mariaflor, who is 23 years old by now, managed to achieve this! With her hard work when she was still taking pictures for FairMail she already earned 7.379 euro. Money which she is investing to study communication sciences at the Cesar Vallejo private university in Trujillo. With her first prize she won a scholarship which means she has to pay only 45 euro per month instead of 110 euro. A discount that is more than welcome to allow Mariaflor to have enough funds to finish her career at the expensive private university. 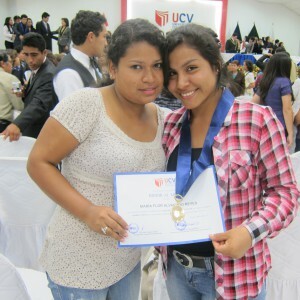 Her mother was present during the award ceremony at the university. According to Mariaflor, her mother says she is proud to have a daughter like Mariaflor. And we are very proud to have a FairMail teenager like her! It comes as no surprise that Mariaflor works very hard to achieve this incredible result. She understand and fully makes use of this chance to get ahead in life. Therefor she spends an average of more than 50 hours per week on her study. Can you believe she even manages to combine all that hard work with her part-time job as co-manager of FairMail Peru? She doesn’t make a big deal of this herself. She just points out the unique opportunity she is grasping to be able to practice what she learns at university, while getting paid job experience at the same time. Her next goal is to specialize her career abroad as this increases opportunities for finding a job afterwards. If anybody has an idea for an organisation where Mariaflor can do her practical period abroad, please let us know. They won’t regret working with a smart and ambitious girl like Mariaflor! We have a lot of faith that Mariaflor will achieve this and are very grateful to have such a lighting example for the new generation of FairMail teenagers in our Peruvian team! If you want you can send Mariaflor an email here.